Today, I would like to introduce an article about unique Japanese side work. ‘Pay rise doesn’t look promising at all, but new work with better payment can be hardly found, too… For people with such worries, ‘graveyard visit’ is becoming popular as an side work. Well, you could easily imagine, this is a work to visit graveyard on behalf of your client. 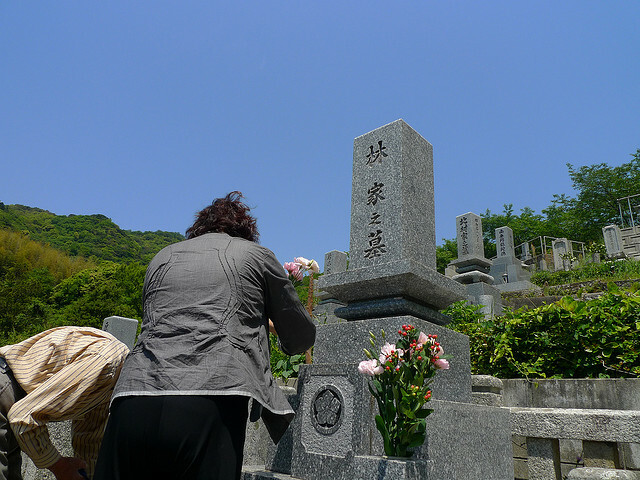 And possible can be elder people, who have physical difficulty to visit their ancestors’ graveyard or busy people, who can hardly have off work to trip to the graveyard (some people has their ancestors’ graveyard miles away) and could not ask other member of family to visit the place. What can be offered from this service can be vary, depending on agents, but basic service is, of course, visiting the graveyard, put some incenses and pray for your ancestors. But some offers weed removal, cleaning, calcareous removal etc. Some even takes a photo of the graveyard, so that a client can see how their ancestors’ graveyard looks like now. FYI, service charge can be vary, ranging from 10,000-20,000 yen (US$125-251).